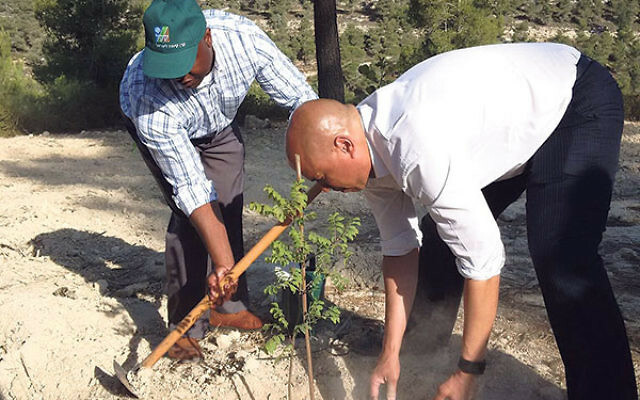 Booker, right, and Sen. Tim Scott plant a tree in honor of President John F. Kennedy at Yad Kennedy, near Jerusalem. In an Aug. 15-24 trip to the Middle East, which included four days spent in what he called “the miracle that is Israel,” New Jersey Sen. Cory Booker found common ground between Ethiopian Israelis and African-Americans. The Democratic legislator was accompanied by another African-American U.S. senator, Tim Scott (R-SC). The two are the first elected African-American senators to hold office at the same time (Mo Cowan, a Democrat from Massachusetts, overlapped with Scott for five months after he was appointed to his seat on an interim basis to replace John Kerry’s vacated seat when Kerry became secretary of state). In an Aug. 29 phone interview with NJJN, Booker said, “I thought I knew the story of the incredible rescue of the Ethiopian Jews,” but he became even more impressed with their “miraculous rescue” after sitting down and listening firsthand to their stories about their 800-mile journey through the desert. One particularly relevant topic, according to Booker, is the interactions between law enforcement and the Ethiopians. Booker said he and Scott met with Prime Minister Benjamin Netanyahu, who told the senators that the issue is so important he made himself chair of the committee charged with exploring how to improve community relations between police and Ethiopians. The senators also met with Tel Aviv Deputy Mayor Mehereta Baruch-Ron, who emigrated from an Ethiopian village at age 10, and Ethiopian-born Knesset Member Dr. Avraham Neguise. Accompanied by America’s Amb. Dan Shapiro, they visited a community center run by the Ethiopian National Project, which operates throughout Israel, sponsoring social and educational programs to help Ethiopians integrate into Israeli society. The ENP’s director of international relations, Grace Rodnitzki, said the organization is supported by Jewish federations throughout New Jersey and the country, particularly the Jewish Federation of Greater MetroWest NJ and the Jewish Federation of Northern NJ. The visit to the center was facilitated by Rabbi Jay Weinstein, former religious leader at Young Israel of East Brunswick, who made aliya in July and now is an assistant to Neguise, helping to organize special projects. In an e-mail to NJJN, Weinstein said the American embassy reached out to Neguise’s office because of the senators’ interest in meeting with Ethiopians, and he connected the visitors with the ENP — with which he is also involved — because its programs benefit Ethiopian-Israeli youth throughout Israel. In Jerusalem, the senators also attended a briefing at the Hagihon Company, which uses cutting-edge technology to improve the service delivery, reuse, and recycling of water. Booker said drought-stricken areas like Georgia or California could benefit from learning about such Israeli practices and technology. Booker and Scott also were briefed by Palestinian security forces about training and security cooperation between the United States, the Palestinian Authority, and Israel. They conferred with former President Shimon Peres at the Peres Center for Peace in Tel Aviv on efforts to bring Israelis and Palestinians together, and took part in a roundtable discussion with cybersecurity entrepreneurs from Be’er Sheva. 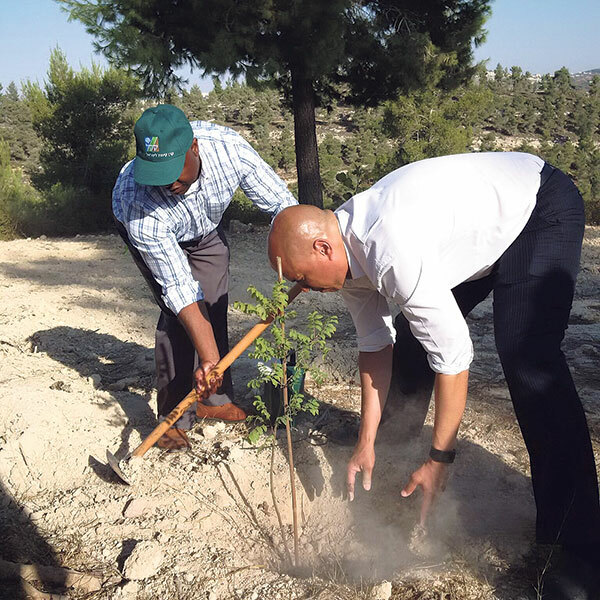 The senators laid a wreath at Yad Vashem, the Holocaust memorial and museum in Jerusalem, and each planted a tree in the Jewish National Fund’s Kennedy Grove near the memorial to the slain president. In addition, they visited Iraq, Qatar, and Jordan, and toured refugee camps housing those fleeing ISIS and the brutal civil war in Syria. Booker called what he witnessed at the refugee camps “heartbreaking” and said the crisis has reached “global proportions” that threaten to destabilize the entire Middle East. “Most people don’t know there are now over three million people displaced,” said Booker. He said military and air support in Iraq to drive ISIS out must continue, that more aid must be given to help those housed in the camps, and that the international community must band together to force a diplomatic solution in Syria.